Download and read thoroughly our Service Policy before requesting an RMA. If you leave a message, you can expect to receive a reply within one business day. And please, treat your equipment with care. 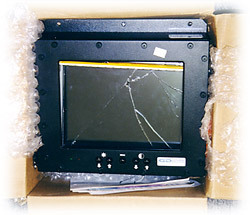 When returning your LCD monitor or other General Digital products, ALWAYS ship in the original packaging, even if the unit is damaged. Service turnaround time will be greatly increased for unanticipated repairs due to shipping damage. Note: If you do not have the original packaging, contact the Service Department to arrange to have all necessary packaging materials sent to you – for which we will charge a nominal cost. It’s inexpensive insurance for ensuring the safest transport of your product, and a quicker turnaround time. Please inspect units upon receipt for any damage. General Digital packages its products to the highest standard; unfortunately, damage can still occur due to careless handling during shipment. Should any damage become apparent during inspection, shipping insurance requires that the carrier be notified within 15 days of receipt of the shipment. Also, the Shipping Department requires 5 days to complete notification to the shipper. This requirement means all packages should be inspected upon receipt and the Shipping Department notified of shipping damage within 10 days of signing for receipt of the package. All packaging (i.e., boxes, foam, inserts and bubble wrap) should be retained for inspection should damage be found. Notification outside the 10-day time frame will result in any shipping damage claim being denied. For damage claims, notify the Shipping Department by phone at 860.282.2900, extension 129.